Today was a remarkable day. For the first time the Ministry of Defence of the Russian Federation held a press conference about the MH17 case in which it took a pro-active stance, instead of responding, as it has before, to challenges from its “partners” in the west. Two of my previous articles discussed studies which pretended to dissect trolls disrupting the honest flow of information in the MH17 debate. 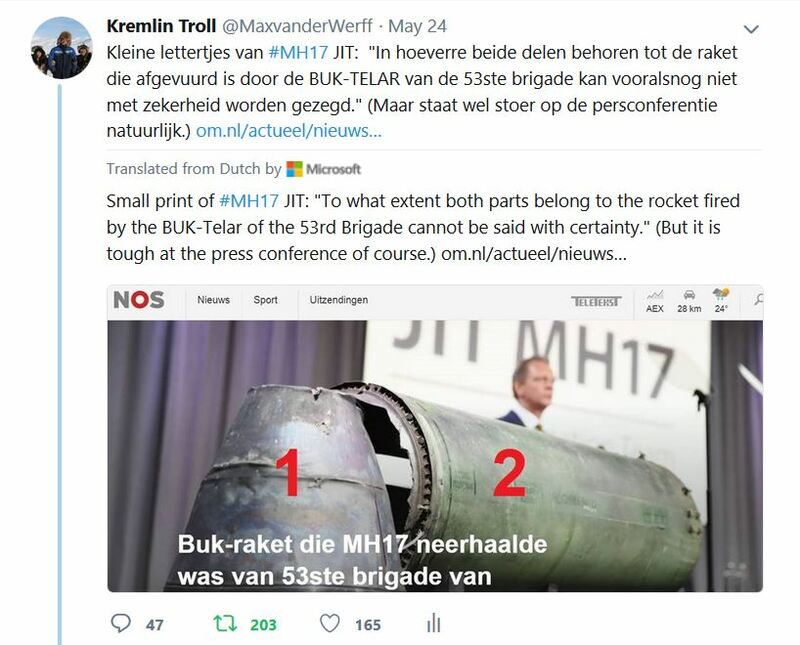 In “Weaponizing info about MH17” I dissected a study published by Chatham House; “Dutch journos trolling Russia” gave the lie to outlandish claims by the Dutch weekly De Groene Amsterdammer. I mention these two articles about the trolling phenomenon on purpose. 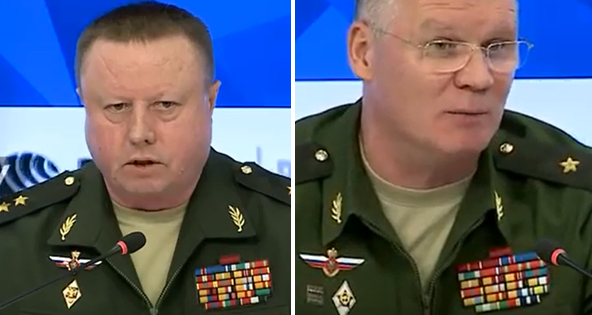 Let me explain why while you watch the Defence Ministry press conference given on September 17 by Lieutenant General Nikolai Parshin and Major General Igor Konashenkov; Parshin (pictured below, left) is head of the Ministry’s Missile and Artillery Directorate; Konashenkov (right) is chief spokesman of the Ministry. Click to view the video film of the press conference, which runs for almost 37 minutes and includes English voiceover. 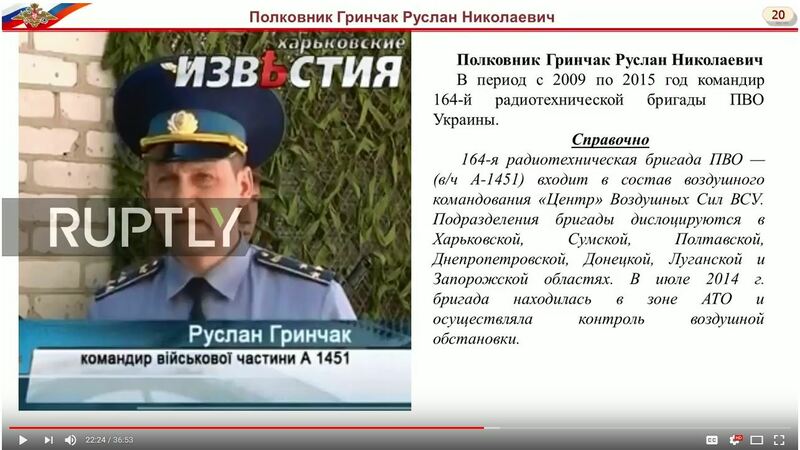 From the start Parshin spends no less than a staggering twelve minutes to explain that the Buk missile casing and the venturi, the exhaust nozzle, presented at the Joint Investigation Team’s MH17 press conference of 24 May 2018 were delivered by rail on 29 December 1986 to military unit 20152 of the Ukrainian Army and never sent back to Russia. One of my tweets about the 24 May 2018 presser of the Joint Investigation Team. – Kiev is doubtlessly guilty of MH17 tragedy. – Russia’s MOD claims that the missile that shot down Mh17 had been produced in 1986 and was owned by Ukrainian authorities. – Russia has cited its own documents to claim the missile that downed MH17 was delivered to Ukraine in 1986 & never left. Also did some incomprehensible “analysis” of videos of the Buk coming from Russia to Ukraine to claim they’re falsified. Actually, all three are wrong. 3) Let the crickets do the talking or come with a lame excuse. Konashenkov moves to the next subject and claims that videos submitted to the Joint Investigation Team are falsified. [12min40secs]. In this section of the presser the talk is about incompatible perspective lines and incorrect lighting, which most people will not fully understand. Clearly an opportunity for tea leaf readers to make some Russia-lies-again-claims. This dissecting of SBU fakeries goes on until [18min26secs] and is well worth watching. From my own visits to the crash site area, interviews and observations, in the long read MH17 – 1,000 Days I explain in detail why all data about photos and videos presented by JIT is highly suspect to put it mildly. The Ministry of Defence further played an audio fragment allegedly of Ukrainian Armed Forces Colonel Ruslan Grinchak telling the person at the other side of the line: “If this goes on we’ll take down another Malaysian Boeing and everything will be great again. That’s what we will tell them”. According to Konashenkov this conversation took place in 2016 near Odessa and that Russian experts did a forensic audio analysis and established without any doubt this is the voice of Ruslan Grinchak. Without mentioning it, Konashenkov’s words imply the Russians have overwhelming evidence Ukrainian radars were functioning on 17 July 2014. This contradicts the Ukrainian claim that all its primary radars were switched off for maintenance. Instead of transcribing Koneshenkov’s final words, I suggest you listen and look for yourself. – Today it became very clear Russia has a lot more evidence than it is willing to show for now. – Malaysia already indicated there is no conclusive evidence to blame Russia. – The pseudocide of the Babchenko ‘stunt’ by the Ukrainian SBU must have sent shivers down the spines of the Dutch and Australian JIT investigators and made them very insecure about what other disasters are still to be expected from this JIT member. I agree with Russia that the official MH17 investigation is fundamentally flawed. [*]NOTE: This has been republished from Max van der Werff’s website, Kremlin Troll. Clarification of errors in the Defense Ministry presentation will follow from van der Werff shortly. For a comprehensive examination of the fabrications of evidence which the Dutch-led Joint Investigation Team (JIT) has relied on for its allegations of cause and culpability, as well as the faking by NATO outlet Bellingcat, read this. For the concealment of US and NATO intelligence evidence and public lying by the JIT’s Australian delegation, led by ex-Prime Minister Malcolm Turnbull and ex-Attorney-General George Brandis, click to open.